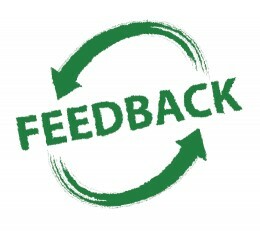 Getting and receiving feedback is part of the professional lifecycle. At some companies, it’s a bi-annual (or even annual) meeting with a superior that entails some kind of compensation or promotion discussion. At others, it happens on a weekly or monthly cadence. But in all jobs, we receive some sort of feedback on an almost daily basis in some form or another. Formal feedback ordinarily entails what is known at most companies as “360 feedback”: comments from peers, superiors and direct reports to encapsulate a full picture of your work. It is parts positive, parts constructive and sometimes parts confusing. For people who are new to the process, positive reinforcement can seem like the most powerful thing. Getting a pat on the back for great work done is what everyone wants to hear – it’s like earning an A on a paper. We often cringe at the constructive stuff: the idea of people publishing negative things about us and focusing on weaknesses is nerve-racking at best. It’s taken me a long time to understand the value of the “negative” but in reality, the feedback simply serves as constructive criticism to make ourselves perfect. As a result, I can’t stress enough the importance of receiving constructive feedback. Nobody is perfect, and the only way we’ll become better professionals and individuals is to hear other people’s commentary on our work. The criticism can range from individual skill development to professional demeanor to public presence. Almost everything (professional, within reason) is fair game, and trust me it’s worth hearing. Ordinarily once you hear it, you’ll begin to notice it and course correct rather quickly. And the advice goes both ways: don’t be afraid to provide with critical feedback on a regular cadence. It’s nothing personal, and the other party will likely be grateful for your opinion. Taking constructive criticism can mean thickening up your skin. It’s hard, and so I try to solicit feedback as often as possible. By receiving it constantly, you become better at digesting the hard stuff. It also makes it less alarming than receiving an onslaught of things to improve. Another way to soften the blow of receiving constructive feedback is to have the person delivering it write it out for you and give it to you to read (either before or during the meeting) so that it’s easier to divorce the subject saying the words from the words themselves. No matter what, treat the subject with dignity. Thank the person for taking the time to improve you, and generally speaking, write it down! You’ll be more inclined to go back to it without the rest of the emotions later on. Anyone else have good methods for coping with receiving feedback? Feel free to Tweet me @ellenjdasilva.